Deeply rooted in Chinese society is the need to belong and conform to a unit, whether the family, a political party or an organization. The family is the focus of life for most Chinese. Age and rank are highly respected. However, to the dismay of older people, today’s young people are rapidly modernizing, wearing blue jeans and sunglasses, drinking Coke and driving motorbikes. Shake hands upon meeting. Chinese may nod ……………or bow instead of shaking hands, although shaking hands has become increasingly common. When introduced to a Chinese group, they may greet you with applause. Applaud back. Senior persons begin greetings. Greet the oldest, most senior person before others. During group introductions, line up according to seniority with the senior person at the head of the line. Use family names and appropriate titles until specifically invited by your Chinese host or colleagues to use their given names. Address the Chinese by Mr., Mrs., Miss plus family name. Note: married women always retain their maiden name. Chinese are often addressed by their government or professional titles. For example, address Li Pang using his title: Mayor Li or Director Li. Names may have two parts; for example: Wang Chien. Traditional Chinese family names are placed first with the given name (which has one or two syllables) coming last (family name: Wang; given: Chien). Chinese generally introduce their guests using their full titles and company names. You should do the same. Example: Doctor John Smith, CEO of American Data Corporation. The Chinese dislike being touched by strangers. Do not touch, hug, lock arms, back slap or make any body contact. Clicking fingers or whistling is considered very rude. Never put your feet on a desk or a chair. Never gesture or pass an object with your feet. Blowing one’s nose in a handkerchief and returning it to one’s pocket is considered vulgar by the Chinese. To beckon a Chinese person, face the palm of your hand downward and move your fingers in a scratching motion. Never use your index finger to beckon anyone. Sucking air in quickly and loudly through lips and teeth expresses distress or surprise at a proposed request. Attempt to change your request, allowing the Chinese to save face. Chinese point with an open hand. Never point with your index finger. The Chinese are practical in business and realize they need Western investment, but dislike dependency on foreigners. They are suspicious and fearful of being cheated or pushed around by foreigners, who are perceived as culturally and economically corrupt. It is very difficult to break through the “them vs. us” philosophy (foreign partner vs. Chinese). In personal relationships, the Chinese will offer friendship and warm hospitality without conflict, but in business they are astute negotiators. Punctuality is important for foreign businesspeople. Being late is rude. Meetings always begin on time. Business cards are exchanged upon meeting. Business cards should be printed in English on one side and Chinese on the other. Make sure the Chinese side uses “simplified” characters and not “classical” characters, which are used in Taiwan and Hong Kong. English is not spoken in business meetings, although some Chinese may understand English without making it known. Hire an interpreter or ask for one to be provided. Be prepared for long meetings and lengthy negotiations (often ten days straight) with many delays. The Chinese will enter a meeting with the highest-ranking person entering first. They will assume the first member of your group to enter the room is the leader of your delegation. The senior Chinese person welcomes everyone. The foreign leader introduces his/her team, and each member distributes his/her card. The leader invites the Chinese to do the same. Seating is very important at a meeting. The host sits to the left of the most important guest. There may be periods of silence at a business meeting; do not interrupt these. A contract is considered a draft subject to change. Chinese may agree on a deal and then change their minds. A signed contract is not binding and does not mean negotiations will end. Observing seniority and rank are extremely important in business. The status of the people who make the initial contact with the Chinese is very important. Don’t insult the Chinese by sending someone with a low rank. Chinese negotiators may try to make foreign negotiators feel guilty about setbacks; they may then manipulate this sense of guilt to achieve certain concessions. Two Chinese negotiating tricks designed to make you agree to concessions are staged temper tantrums and a feigned sense of urgency. If the Chinese side no longer wishes to pursue the deal, they may not tell you. To save their own face, they may become increasingly inflexible and hard-nosed, forcing you to break off negotiations. In this way, they may avoid blame for the failure. Dining is used to probe positions without any formal commitment. Business is generally not discussed during meals. Meals are a vehicle for indirect business references. The Chinese are superb hosts. Twelve-course banquets with frequent toasts are a Chinese trademark. 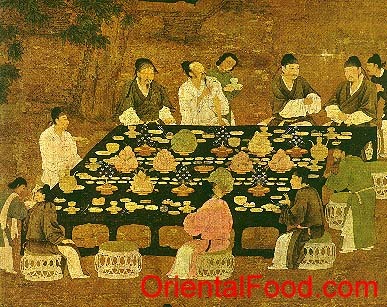 The Chinese sponsoring organization generally hosts a welcoming banquet. Foreign guests should reciprocate toward the end of their visits. Invite everyone with whom you have dealt. Always arrive exactly on time for a banquet. Never arrive early for dinner. This implies that you are hungry and might cause you to lose face. Spouses are not usually included in business entertaining, however, businesspeople may bring their secretaries. Be prepared to make a small toast for all occasions. The first toast normally occurs during or after the first course, not before. After the next course, the guest should reciprocate. Three glasses — a large one for beer, soda or mineral water, a small wine glass and a stemmed shot glass — are at each place setting. The shot glass is the one used for toasting. It is not necessary to always drain your glass after a ganbei (bottoms up), although a host should encourage it. Do not drink until you toast others at the table. Chinese consider drinking alone to be rude. Simply raising your glass and making eye contact is sufficient. If you are toasted, sip your drink in reply. A toast to friendship among companies will help cement a business relationship. Unless you are totally drunk, it is not advised to refuse a drink. Sipping your drink is perfectly acceptable. Leave some food on your plate during each course of a meal to honor the generosity of your host. It is bad manners for a Chinese host not to keep refilling guests’ plates or teacups. Seating is very important. The guest of honor is always placed at the head of the room, facing the door. Allow the host to begin eating before joining in. Do not discuss business at dinner unless your Chinese counterpart initiates it. Slurping soup and belching are acceptable. Cover your mouth with your hand when using a toothpick. Put bones, seeds, etc. on the table, never in your rice bowl. Chopsticks are used for all meals. Tapping your chopsticks on the table is considered very rude. When finished eating, place your chopsticks neatly on the table or on the chopstick rest. When hosting, order one dish for every person present and one extra. In addition, order rice, noodles and buns. Soup usually comes at some point during the meal. The host should tell his/her guests to begin eating a new dish before he digs in himself. The host (the one who invites) pays the bill for everyone. If you are the guest of honor at a dinner, leave shortly after the meal is finished, as no one will leave before the guest of honor. Breakfast meetings are rare, but you may request one. Guests are rarely invited to a Chinese home. It is an honor to be a guest. Be on time or a little early for an invitation, and take a small gift. Bedrooms and kitchens are private. Don’t enter these rooms unless you are invited to do so. All dishes are served at once in a home. The host will place portions of each dish on guests’ plates. Sample each dish. Rare beef is considered barbaric by the Chinese. Conservative, simple, unpretentious, modest clothing should be worn — nothing flashy or overly fashionable. Women should avoid bare backs, shorts, low-cut tops and excessive jewelry. For business, men should wear sport coats and ties. Slacks and open-necked shirts are generally suitable in the summer for business meetings; jackets and ties are not necessary. Women should wear dresses or pantsuits for business and should avoid heavy make-up and dangling, gaudy jewelry. Present a gift with both hands. Gifts are generally not opened upon receiving. Always give a gift to everyone present or don’t give gifts at all. Older Chinese usually refuse a gift at first to be polite. Offer a second time. Never give a gift of great value until a clear relationship is established. This would cause embarrassment and may not be accepted. Never give gifts in sets (i.e., dishes), but never in sets of four (a number associated with death). Avoid white, which is symbolic of death, especially of parents, and black, which symbolizes tragedy or death. When invited to someone’s home, always bring a small gift for the hostess, such as brandy, chocolates or cakes. Be prepared to exchange a modest gift with your business colleagues at the first meeting. Not giving a gift could start a business meeting off on the wrong foot. Always give gifts to each member of the Chinese delegation that meets you in the order in which they were introduced. Suggested gifts: cigarettes (especially Marlboro and Kent), French brandy, whiskey, pens, lighters, desk attire, cognac, books, framed paintings. Give more valuable gifts — like cellular phones or small CD players — to senior level people. Give a group gift from your company to the host company. Present this gift to the leader of the delegation. Chinese find “no” difficult to say. They may say “maybe” or “we’ll see” in order to save face. Do not in any way suggest that Taiwan is not part of China. Show respect for older people. Offer a seat or right of way through the door to a colleague or older person as a polite gesture. Refrain from being loud, boisterous or showy. Do not be insulted if the Chinese ask personal questions such as “How much money do you make?” “How many children do you have?” or “Are you married?” Just change the subject if you do not want to answer. Asking about divorce would cause a Chinese person to lose face. Forcing the Chinese to say “no” will quickly end a relationship. Never say or act like you are starving and don’t ask for a doggy bag. Most Chinese women don’t wear wedding rings. Don’t assume marital status. China is a difficult place for anyone to conduct business. A woman may gain acceptance, but it will take time and will not be easy. China is a male-dominated society. However, there are many women in business in China and some occupy high-ranking positions and important managerial jobs. One of the principles of the Chinese communist system is to work toward sexual equality. Negotiating teams may have women members. Women may be used to decline unpopular proposals. Businesswomen attend business dinners, but rarely bring their spouses. Chinese women rarely smoke or drink. However, it is acceptable for Western women to do so moderately.